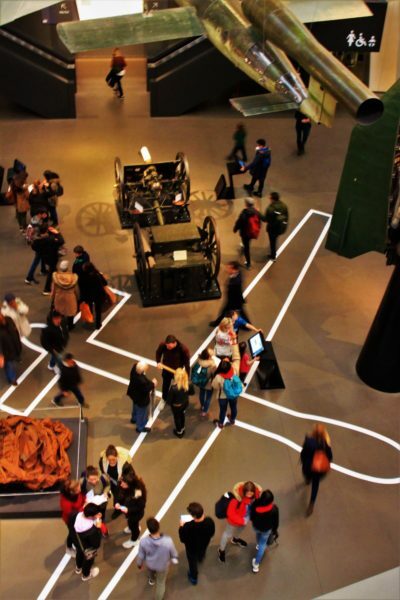 When looking down from the atrium of the Imperial War Museum, it’s hard to look away from the unguided missiles of WWII, or the spitfire and harrier aircraft so intimately linked with the concept of terror. Take a moment to look at the floor however, and the visitor is presented with another sight. Occasionally covered by the crowds of visitors pouring through the entrance, another more ominous, disturbingly familiar silhouette is present, instantly recognisable to those who have seen news reports of US military activity. The hollow outline of a Predator drone. This artwork, titled Drone Shadow, Predator (2017) by James Bridle, marks the first exhibit in the IWM’s ‘Age of Terror’ exhibition, which looks at the repercussions of 9/11 on world affairs, and how artists have responded to this event. Bridle is one of more than 40 artists participating in the museum’s largest ever exhibition of contemporary art, spread over three galleries, which focus on 9/11 itself, the increase in state control, the use of weapons, and the impact at home. Exhibited artists include Ai Weiwei, Hans Feldman, Tony Ousler, and Kennard Phillips to name a few. The first gallery explores the initial impact of 9/11 on local, as well as international, contemporary artists. Hans Feldman lines a corridor with newspapers from news outlets the world over, each displaying its caption of the atrocity and accompanying image. Most newspapers recognise the immensity of 9/11 instantaneously; The Guardian largely devoted its entire front page to the headline, “War on America”. 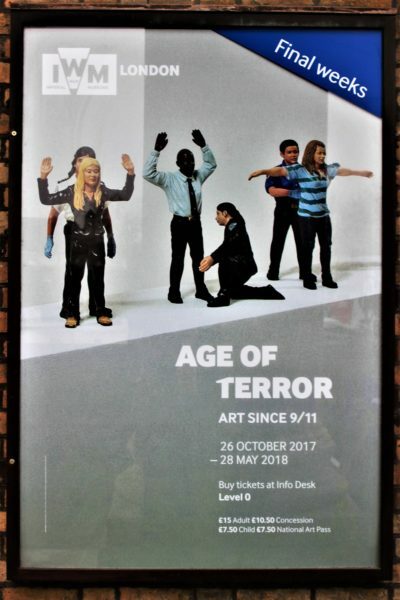 Here the art is moving in its scale, but flawed with an ambiguity of message, best summarised by Bernadette McNulty, “Was this an attack on New York, America, or the entire world? Was this ‘Armageddon’, ‘the Apocalypse’ or ‘Doomsday’?”. This lack of clarity is a reoccurring theme in the exhibition, as it is unclear what the ‘terror’ refers to. Ai Weiwei’s Surveillance Camera, with clean lines immortalised in marble, hints more at the threats of an omnipotent government than the terror of a nation under attack. Jake & Dinos Chapman’s Nein! Eleven feels like a tacky reductive joke, referencing Nazi terror for no reason other than pop familiarity. On the other hand, Nathan Coley’s A Place Beyond Belief (2012), where the title is illuminated in neon, leaves the viewer open to quiet reflection; Indre Serpytyte’s abstract painting of metallic vertical lines is chilling, once the viewer realises they represent the façade of one of the towers as seen by someone who jumped and fell past at an estimated 150 miles per hour. Although there are certainly weaknesses with this exhibition (Why is today’s terror so different from the terror of war the museum usually displays? What purpose does this art serve in remembering the already tragically permanent image of 9/11? Can art ever really respect the immense personal impact and loss of life due to terror?) it is a worthwhile and highly recommended visit. Not to understand the central events, but to experience an understanding of how the horrific events have affected our attitude towards everyday life.